In addition to the large number of pilgrimage churches in Austria, there are some very famous and very elaborate monasteries. Two Benedictine complexes that have had a tremendous impact on the history and development of Austria are the one in Melk on the Donau about an hour from Vienna and Admont, which is almost at the geographical center of the country. Both monasteries have responsibility for surrounding parish churches as well as agribusinesses to make money for the order. Both sell locally produced decent wines and schnappes, as well as marmalade and honey products. The monks are expected to work as well as pray and study. 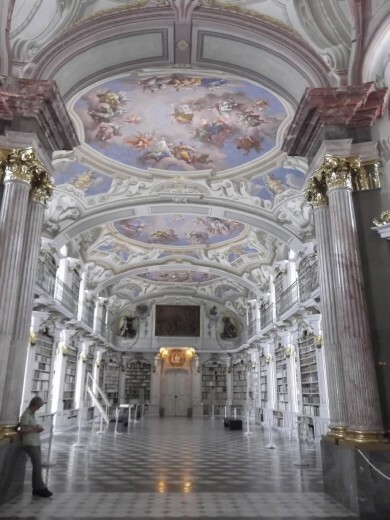 As Benedict was a firm believer in learning, both Admont and Melk have sizable libraries. Admont’s is said to be the largest monastic library in Europe (& for Christianity it is the largest monastic library in the world). The Buddhists can lay claim to the largest monastic library, although, the one in the Potala has taken quite a hit over the past 60 years. The Buddhist monastic library in Dharamsala and the one in Gangtok, however, are as impressive as the Catholic monastic library in Admont, although the styles are dramatically different. Admont was founded in 1074 by the Archbishop of Salzburg, Gebhard, who wanted to convert the local pagan farmers. By 1200, the monastery already had a ‘scriptorium” a place here the monks would write, copy and read manuscipts and books. By the middle of the 18th C, the library that is visitable today, was completed. When it was opened for viewing, it was called the eighth wonder of the world. Completed in 1776, it is 70 meters long, 14m wide, and about 12 m high. The complex where the library is found has 7 domes and 60 windows. Tying the architectural elements together are a series of frescoes highlighting the enlightenment ideas that were popular at the time. Bartolomeo Altomontes created a fresco cycle for each of the domes with supplementary and complementary frescos for the walls and the remainder of the ceiling. In the middle of the large center dome, the artist portrays personified Divine Wisdom, who is flanked by Moses and a small female figure said to be the representative spirit of the Counter Reformation The painting is called the “Göttliche Offenbarung” or Divine Revelation. She protects all the arts and sciences that were recognized by enlightenment thinkers; e.g. the first fresco illustrates the interaction of the Arts and their corresponding techniques, the next is about the natural sciences and third is the personification of theology on a throne (not unlike the Catal Huyuk goddess from the 8th millennia B.C.E. The other side of the central dome deals with the laws of man versus the laws of nature and the cosmos. The idea for entire architectural and pictorial illustration of enlightenment ideals came from Josef Hueber, who wanted to bring Rococo lightness into the mystery of the Baroque. The library is also graced with a number of wood carved statues from the local Styrian sculptor Josef Stammel. He completed his set of reliefs, 12 Biblical figres and the personification of Honor as well as the golden busts for the walls during the construction of the library. His four large works, the “Four Last Things,” representing Death, Judgment, Heaven and Hell, were completed 16 years before the library and are much more Baroque in spirit. In a way, their presence in the room creates an excellent example of the transition in thought from one age to the next. "more than half of which come from the Middle Ages. The number of incunabula (books printed before 1500) and early printed works (works printed in the period of 1501-1520) runs to over 930. The oldest items were brought by the first monks from the mother house St. Peter in Salzburg as gifts of the founder, Archbishop Gebhard." Since the 12th C Admont Monastery possessed a very productive scriptorium (writing room) where books were produced for its own use and for other religious houses. Through the great number of artistically decorated manuscripts and incunabula (with ornaments, miniatures and woodcuts) the holding represent a considerable art collection. From the scientific point of view the Admont collection of manuscripts and incunabula offers a wealth of valuable source material for numerous areas of research. Both libraries allow scholars to use the works if they ask for permission in writing ahead of time. The library in Melk is much smaller and darker than the one in Admont, but it too houses a number of very valuable manuscripts and incunabula, including one from the 11th C. that first mentions the name Austria in relation to the Babenbergers, the ruling family prior to the Hapsburgs. I found it fascinating that I was allowed to take pictures of the library in Admont, but not in Melk, but was allowed to take pictures in the museum in Melk, but not in Admont. The Church in Melk is really the highpoint of any journey to the monastery. It is a Baroque masterpiece, with its interplay of marble, gold and intricate designs. Anything I write will not do it justice, so please just look at the images in the gallery file. Do look for the Spiral Staircase, which is so representative of this period. What is most amazing about this site is that these amazing frescoes from about 1300 were found in the 1960s/70s during restoration work. The tower in which they were found is adjacent to the small church and is in itself tiny. While the previously mentioned pilgrimage churches were made to accommodate masses of people, this was clearly just a village church. But it is one with incredible artwork. Pürgg is a very small village, and if one didn’t know about the frescoes, you could miss them. The village is considered to be one of the prettiest in Austria as it is set very near the Taupilz ski resort amid the lush mountains of northern Styria. “include scenes from the Passion of Christ and the visualization of of Jacobus de Voragine (ca. 1273), who concentrated on St. Katherine in the two rows of painting on the walls. The themes of the upper row from left to rights: The wheels on which Katherine was tortured, Christ in the Mandorla with Emperor Maxentius and Porphyrius (window); Katherine being burned, the burning of converted Christians; Visit of Empress Faustina in the prison, and Katherine discussing with scholars. The lower row shows the resurrection of Christ and a patron in rather good condition. A Martins scene is suggested. The frescoes are in the end phase of the Zackenstiles, as is evident from the figures. The Apostle cross could be a hint that the room was at least occasionally used for prayer services and mass.